This course is cross-listed with English 2251. Date Assignments are due on the date to the left. Jan. 18 Introduction. 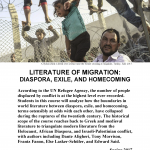 Defining migrant literature. 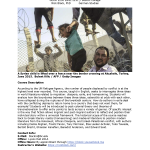 ➜ Bible as migrant literature? ➜ Focus on how Jews enter into his discussion of colonized identity. Feb. 6 🚫 Class cancelled - Prof. Block lecturing at another university. ➜ Focus on subjectivity (e.g., “I and I”) in exile. Compare with Hebrew Ballads. May 3 🎓 Last Day. Course Synthesis. May 10 📥 Final Essay and makeup work due by May 10 at 11am.